52 Lukie Points will be rewarded to you when you buy this. Secret of Mana SNES Super Nintendo Game Cartridge Cleaned Tested and Guaranteed to Work! A great dog that is also multiplayer for up to 3 players if you have a multitap. Great story and enjoyable game play make it one of the best snes Rpgs. Alright, but not as much fun as I remember. I remember being in love with this game when I was in high school, but now I have a hard time getting into it. Maybe it's because I'm playing Zelda Twilight Princess HD on the Wii U, Mass Effect on the PS3, and Majora's Mask on the 3DS...it just hasn't aged as well as I hoped. A highly underrated gem. 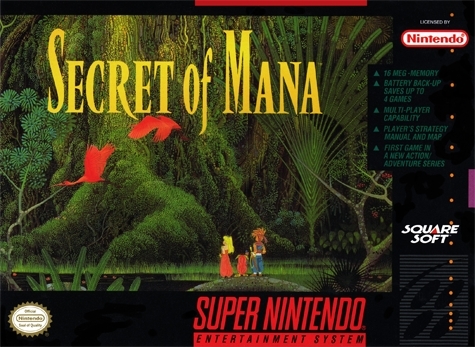 Secret of Mana is a fantastic multi-player jrpg offering a great story, gorgeous visuals, and hours of game play. The copy I received from Lukiegames was aesthetically flawless and played without difficulty. It works great and lovin it. Best game on sneak as far as I'm concerned. I like playing multi-player but one player is fun also. Just the magic and how the weapons level up and how u can buy better armor. Really whoever made this did a great job. A lot of details for how old this game is. Must buy! Excellent game! I got a perfect copy from Lukie, battery still works so can still save progress. As for the gameplay it's one of the best for the SNES and that is saying a lot! Secret of Mana is a fascinating RPG with a nearly unmatched real-time battle system, beautiful graphics, and although maybe not as good as FF3 soundtrack it is still amazing. 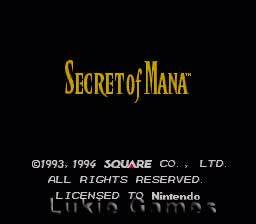 After all these years, Secret of Mana still stands out as one of the greatest games ever made. It has a unique charm to it that no other game has ever matched. 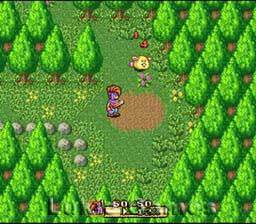 Even though there are many thing worth mentioning about Secret of Mana the most distinctive feature Id have to say is its 3 player co-op mode that inables you to play with 2 or even 3 players all at the sametime. 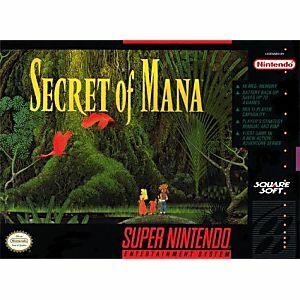 Secret of Mana is a great game and is a must have for any serious RPG fan. Id give it a solid 8/10. I've always really enjoyed this game, and I just couldn't resist ordering it. The game shipped very quickly, and is in pristine condition. I was never able to find it in game shops or pawn shops in my area, so I have Lukie Games to thank for finally grabbing the game at a fair price. This is one of the best SNES RPGs. It has fun gameplay, colorful graphics, co-op, that weird menu system and some good music. It isn't perfect either, though. For starters, I tried explaining the controls to a friend, but its menu system can only be used by someone that has spent enough time with the game, so the co-op two player was not very enjoyable. Also, the story is really weak and is swimming in typical JRPG cliches. The dialogue is sometimes just painfully boring and awkward. In addition, most characters are dull and the ones that are cool don't talk very much. Overall, this is a good choice for SNES RPG fans, but it isn't quite as good as Final Fantasy III or Chrono Trigger. Definitely one of the best games for SNES or any other system. The ring menu system is easy to use, the story is very strong, and the gameplay is fun and fast-paced. A must have for RPG fans.